The September 24th issue of the New England Journal of Medicine has an excellent review article by Ginès and Schrier on Renal Failure in Cirrhosis. It reviews the pathogenesis of the circulatory events by which severe liver disease compromises renal function. Surprisingly, the authors omit a key step in the pathophysiology of compensated cirrhosis. Look at the left panel and you see the cartoon go from low effective arterial blood volume to both increased cardiac output and increase blood volume which then restores effective arterial blood volume to normal. 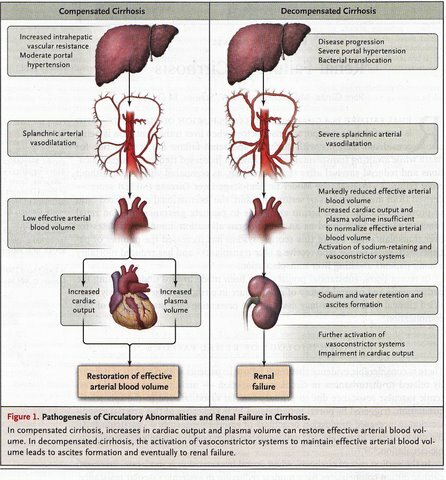 What’s left out is the means that allows cardiac output and blood volume to increase, ie transient renal salt retention. Without a period of positive salt balance neither cardiac output or blood volume could increase. There is no doubt that the authors of this piece are fully aware of this phenomenon, it just got lost somehow. But it’s an important event which deserves emphasis. For blood volume to expand, absent an infusion of fluid, the kidney must retain salt. To be precise, the sequence should be low volume, renal salt retention, increased blood volume which increases cardiac output resulting in a new steady state of normal effective arterial volume. For a slide presentation on the Hepatorenal Syndrome go here.